The cost of imprisonment — including who benefits and who pays — is a major part of the national discussion around criminal justice policy. But prisons and jails are just one piece of the criminal justice system and the amount of media and policy attention that the various players get is not necessarily proportional to their influence. we share all of our sources so that journalists and advocates can build upon our work. The criminal justice system is overwhelmingly a public system, with private prison companies acting only as extensions of the public system. The government payroll for corrections employees is over 100 times higher than the private prison industry’s profits. Despite the fact that the Constitution requires counsel to be appointed for defendants unable to afford legal representation, the system only spends $4.5 billion on this right. And over the last decade, states have been reducing this figure even as caseloads have grown. Private companies that supply goods to the prison commissary or provide telephone service for correctional facilities bring in almost as much money ($2.9 billion) as governments pay private companies ($3.9 billion) to operate private prisons. Feeding and providing health care for 2.3 million people — a population larger than that of 15 different states3 — is expensive. This report and infographic are a first step toward better understanding who benefits from mass incarceration and who might be resistant to reform. We have no doubt that we missed some costs, and we did not include some costs because they are relatively small in the big picture or are currently unknowable. But, by following the money, one can see that private prison corporations aren’t the only ones who benefit from mass incarceration. Bail bond companies that collect $1.4 billion in nonrefundable fees from defendants and their families. The industry also actively works to block reforms that threaten its profits, even if reforms could prevent people from being detained in jail because of their poverty. Specialized phone companies that win monopoly contracts and charge families up to $24.95 for a 15-minute phone call. Commissary vendors that sell goods to incarcerated people — who rely largely on money sent by loved ones — is an even larger industry that brings in $1.6 billion a year. To be sure, there are ideological as well as economic reasons for mass incarceration and over-criminalization. But at this moment, when crime is near record lows and there is increasing attention to the role of privatization in the justice system, we need a far more expansive view of how our criminal justice system works, whom it hurts, and whom it really serves. If we are to make our society safer and stronger, we’ll need to be making far smarter investments than we are today. While this report asks a very simple question about the financial costs of mass incarceration, a comprehensive answer has never existed before because the government doesn’t collect or organize these statistics in one place. 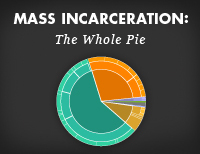 Like our report, Mass Incarceration: The Whole Pie, which looked at who is behind bars and why, this report aggregates economic data that have never been put together before to offer a big picture view of who pays for and who benefits from mass incarceration. $81 billion6 addressing only the cost of running the corrections system (prisons, jails, parole, and probation), thereby missing the policing and court costs, and all of the other costs that families have to pay to support their incarcerated loved ones. 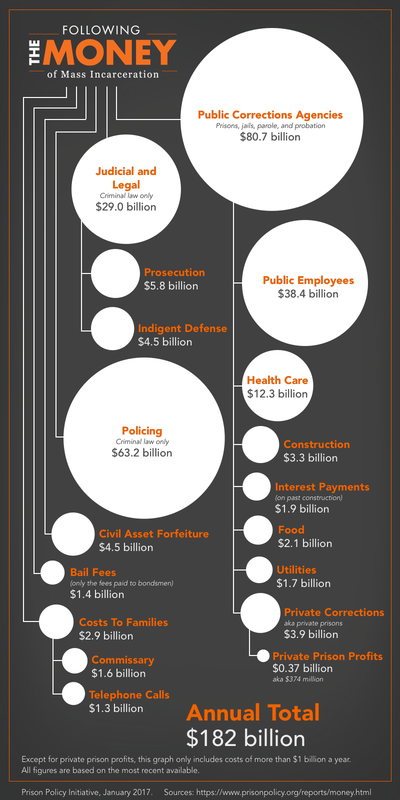 $265 billion7, includes the costs of federal, state, and local corrections and the entire police and court systems. This figure does not separate out the civil parts of the police and court systems nor does it address the collateral costs paid by the families of incarcerated people. This report’s goal is to identify the total cost of mass incarceration and the comparative investment that each part of that system has in the status quo. We wanted to take a holistic view without also exaggerating our findings by including tens of billions of dollars in policing and court expenses that have little to do with the enforcement of criminal law. We decided not to include any expenses that do not appear to add up to at least $1 billion a year, for example, the money transfer industry, or the release card industry. There are many items for which there are no national statistics available and no straightforward way to develop a national figure from the limited state and local data. For example, criminal justice fines and fees can be substantial. In at least 38 towns and cities in the U.S., more than 10% of all revenue is collected from court fines and fees. In St. Louis County, five towns generated more than 40% of their annual revenue from court fines and fees in 2013. Given the tremendous variability between different jurisdictions, we did not see a way to develop a national figure and decided not to provide one at all. However, the existing research8 makes it clear that the insidious, yet largely invisible system of fines and fees should be priority for research to drive policy reform. Our effort to separate out the civil components of policing and judicial and legal expenditures cannot be considered complete, and some technically civil costs are included in our report. As we explain in the sections on policing and the judicial and legal system below, our adjustment is both rough and subject to definitional weaknesses. We would, for future reports, be very interested in seeing studies that estimate the civil vs. criminal breakdown in individual jurisdictions in order to improve our national estimates. Moreover, we do include the cost of civil immigration detention. While these facilities and the confinement there are technically civil, in reality, they are quite like prisons. We also include civil asset forfeiture because civil asset forfeiture is a mechanism by which law enforcement agencies can seize and retain property on the suspicion that the property is connected to a crime. We don’t fully track how money paid by families or seized from defendants is then used by the system. For example, private telephone and commissary companies often kickback a portion of their revenue to the government entity that awarded the contract. While important, this revenue often goes to the state or county’s general fund, so we chose not to include that complication.10 Similarly, revenue from civil asset forfeiture is generally used to benefit the police or district attorney’s offices. What follows is a description of the data sources and assumptions used for each part of the infographic. Each circle’s area is in proportion with the value being represented. We welcome ideas on newer data sources, more precise estimates, and information on costs that we missed. While our calculations are aimed at excluding costs associated with the civil justice system, it is important to recognize that mass incarceration has substantial economic impacts on civil courts. First, a material portion of the federal courts’ workload consists of habeas corpus petitions, motions to vacate sentences, complaints involving prison conditions and cases concerning the civil rights of incarcerated people. These are all reported as civil matters, even though they are driven by the system of mass criminalization. Data from the federal court system shows that such matters constituted 20% of district court civil filings and 48% of appellate court civil filings in the year ending in March 2015.13 Second, courts’ criminal caseloads can “squeeze out” civil cases.14 Since 1986, workloads for federal judges have increased, driven by the increase in criminal cases. Unlike civil cases, criminal defendants have a right to a speedy trial, which means that as criminal workload increases, judges are sometimes forced to prioritize criminal cases, resulting in a slower pace for civil matters and imposing opportunity costs on civil litigants. Presumably this dynamic is even more acute in state courts, which handle more criminal cases than the federal system. Judicial and legal expenditures include expenses for prosecutors ($5.8 billion in 2007)15 and for indigent defense ($4.5 billion in 2008).16 The indigent defense expenses include both public defender agencies and private counsel appointed by the courts; but it would not include the currently unknown number of billions paid by individuals and families to private defense and appellate attorneys. And notably, judicial and legal costs do not include monetary payments paid by governments when it is sued in a judicial or administrative proceeding. The Bureau of Justice Statistics reports in Justice Expenditure And Employment Extracts, 2012 that the combined total of federal, state and local expenditures on policing was $126.4 billion in 2012. Unfortunately and significantly, these figures do not include separate costs for the criminal and civil components of police work, so we used Nils Christie’s estimate that 50% of police expenditures are related to the enforcement of the criminal law to reduce the Bureau of Justice Statistics figure by half.17 We also note a Cincinnati, Ohio study, which found that police officers spend 33% of their time patrolling and 17% on crime calls. There is, obviously, an urgent need for more precise data on police expenditures for projects like this report and, more importantly, to help state and local governments make useful, comparative policy decisions about what are and what are not appropriate duties for law enforcement. There is likely some overlap between the $4.5 billion net assets of the Department of Justice and Treasury forfeiture funds and the expenditures reported for the policing and judicial and legal systems. We didn’t adjust the policing and judicial and legal system figures because it is likely impossible to figure out how much overlap there is and to determine how the money is distributed among the various government agencies. The federal government and states vary in what percentage of the seized property can be kept by the law enforcement agency that seized the property. While this report adjusts policing and judicial and legal costs to focus on the criminal parts of these systems and exclude the civil parts, we include civil asset forfeiture because civil asset forfeiture is a mechanism by which law enforcement agencies can seize and retain property on the suspicion that the property is connected to a crime. In its report, For Better or For Profit: How the Bail Bonding Industry Stands in the Way of Fair and Effective Pretrial Justice, the Justice Policy Institute uses a figure of $14 billion in bail bonds written every year, and cites its source as an email from Dennis Bartlett from the American Bail Coalition (which lobbies on behalf of the bail bondsman industry) in footnote 2 of the Executive Summary of the report. Since defendants and their family members typically pay 10% to commercial bail bond agencies as a nonrefundable fee, this comes out to $1.4 billion actually paid by the families. To learn more about the high costs of money bail in the U.S., see our report Detaining the Poor: How money bail perpetuates an endless cycle of poverty and jail time. For our calculations of the total value of commissary expenditures, see Stephen Raher, Paging anti-trust lawyers: Prison commissary giants prepare to merge, July 5, 2016. We assigned incarcerated people’s commissary purchases to a section on money spent by families precisely because incarcerated people don’t make very much money. Many people confined in jails don’t work, and four state prison systems19 don’t pay at all. And the states that pay for work aren’t much better. Looking at just the states that paid incarcerated people for non-industry work in 2001, the average minimum wage per day was 93 cents. Therefore, the majority of the money spent on commissary comes from the families of incarcerated people and not from the incarcerated people themselves. As with the telephone industry (below), a portion of this cost to the families feeds back into the $81 billion correctional budgets via the corrupt commission system — where private companies provide commissary services for correctional facilities but share a percentage of the revenue with the government. In this way, it’s possible we are counting these dollars twice in our total estimate, although our methodology of ignoring costs under a billion dollars more than makes up for any double counting in this respect. Lee Petro, pro bono counsel for the Wright Petitioners analyzed the 2015 financial reports of 13 prison telephone companies, including the nation’s largest, which were required to submit that information to Alabama state regulators. For one large company, CenturyLink, he used the 2014 figure because an accounting change at that company included its other, non-prison related, businesses in the 2015 figure, but he expects the telephone figure for CenturyLink to be generally unchanged from 2014 to 2015. Other companies not regulated by the state of Alabama are not included, so this is a slight under-estimate. In some locations these costs are physically paid by incarcerated people and in some cases by the families, but regardless of who makes the payment, the source of the funds is almost entirely the families. A large portion of this cost to the families feeds back into the $81 billion correctional budgets via the corrupt commission system — where contracts are awarded not on the basis of the best price and service to the consumer but on the size of the revenue that is paid to the government authority that awards the monopoly contract. In this way, it’s possible we are counting these dollars twice in our total estimate, although our methodology of ignoring costs under a billion dollars more than makes up for any double counting in this respect. Public employees: We multiplied the March 2012 payroll amount of $3,199,078,000 for the 749,418 corrections employees at the federal, state, and local level reported in spreadsheet table 2 from Justice Expenditure And Employment Extracts, 2012 by 12 to get an annual figure of $38.4 billion. This figure doesn’t include state and local contributions to retiree pensions because many governments make lump-sum contributions to retirement systems and cannot separate out justice employees. For more information on corrections retiree pension and health care costs by state, see Vera Institute of Justice, Price of Prisons. In addition, this figure does not include contractors. There is tremendous variation in the data, raising some questions about both the quality of care being provided and how different states calculate their data. We note that the highest per capita cost was in California at $11,986 and the lowest was in Illinois of $2,217. By these figures, 15.3% of the national correctional health care expenditures are in the California state prison system. For our national estimate, we used state prison costs to estimate jail costs. If medical costs are higher in jails due to screening and treating the 11 million people who pass through jails each year (as seems likely), then this figure would be a significant understatement. It is possible that some of these costs are also reflected in the correctional employee payroll cost, but we think this overlap would be minimal. Medications and medical supplies would be in health care and not labor; and a lot of medical care is provided by contractors — either individual contractors or private medical care companies like Corizon — so those workers would not also be reflected in the public employees category.20 Table 4 of Census of State and Federal Correction Facilities, 2005, supports our belief that we are not engaging in any substantial double counting as the table reports that just 10% of non-contractor staff are “professional/technical”. Reading further, we see that “professional and technical” staff include several other categories beyond medical such as chaplains and social workers. Therefore the portion of public employees that is medical must be under 10%. And because contractors do much of this work, the practical overlap is likely quite small and far smaller than the impact of inflation. Many prisons are built with borrowed money. When governments borrow money, they usually issue bonds that pay interest to investors (typically institutional investors such as pension funds). The principal amount of such bonds is already included in the construction-cost segment of our graphic. Because there is no available data on the interest expense associated with prison-specific bonds, we calculated that figure as follows. In recent decades, municipal bonds have paid interest for an average period of 18 years, according to the Securities Industry and Financial Markets Association (SIFMA) [Excel]. Accordingly, to estimate the total interest expense in any given year, one must calculate the principal amount of bonds issued during the preceding 18 years. We looked at prison bonds from 1998 through 2015. For 2012 through 2015, we relied on SIFMA’s Municipal Bond Credit Report series, which reports the principal amount of all municipal bonds issued for construction of state and local correctional facilities. For years prior to 2012, we obtained state prison-bond figures from the National Association of State Budget Officers’ State Expenditure Report series (NASBO reports only state bonds; thus, we estimated local government bonds by calculating the ratio of state-to-local correctional facility bonds in 2012-15, and extrapolating local bond issuances for 1998-2011 based on the same ratio). The aforementioned calculations resulted in an estimated principal amount of $47.4 billion between 1998 and 2015. Unfortunately there is no way to know what interest rate the different bonds were paying, so we calculated interest by conservatively assuming an average rate of 4%, although actual rates for prison bonds are likely higher. Food is another large factor where the data is hard to access. The Bureau of Justice Statistics reports in State Prison Expenditures, 2001 (table 5) that the per capita food cost was $955 per year — $2.62 per day. Multiplying this figure by 2.3 million incarcerated people produces a total annual expenditure of $2.197 billion. Because our visualization separates out private prisons, we multiplied the annual figure by the number of people in private prisons, and concluded that $125 million was too small to include in the graph. The far larger number of people confined in publicly run prisons, however, sums to $2.071 billion and is labeled on the data visualization. The Bureau of Justice Statistics reports in State Prison Expenditures, 2001 (table 5) that the per capita utility cost was $795 per year. Multiplying this figure by 2.3 million incarcerated people produces a total expenditure of $1.8 billion. Because our visualization separates out private prisons, we multiplied the annual figure by the number of people in private prisons, and concluded that $104 million was too small to include in the infographic. The far larger number of people confined in publicly run prisons, however, sums to $1.7 billion and is labeled on the data visualization. Given that energy costs have been rising faster than inflation, this could be much higher. Utility costs should not be ignored because, as Ruth Gilmore explains in Golden Gulag: Prisons, Surplus, Crisis and Opposition in Globalizing California, prisons (and large jails) are essentially small cities with the water, heating and electrical demands of — as you would expect once you begin to see the facilities that way — small cities. To illustrate both the scale of the private prison industry and the critical fact that this industry works under contract for government agencies — rather than arresting, prosecuting, convicting and incarcerating people on its own — we displayed these companies as a subset of the public corrections system. This industry is dominated by two large publicly traded companies — CoreCivic (which until recently was called Corrections Corporation of America (CCA)) and The GEO Group — as well as one small private company, Management & Training Corp (MTC). We relied on the public annual reports of the two large companies, and estimated MTC’s figures using records from a decade-old public record request. In 2015, CoreCivic (Corrections Corporation of America) received $911.8 million in federal money from its various prison-related contracts. This equates to about 51% of its total annual revenue. (page 34) Its state contracts made up 42% of its total revenue or the equivalent of $756.9 million in 2015. (page 10) Adding these two figures together gets a total revenue for CoreCivic from state and federal contracts of $1.67 billion. Page 52 of its 2015 annual report says its “net income” (aka profits) was $222 million. These profits may include profits beyond private prisons such as CoreCivic’s profits from providing transportation services for governmental agencies (page 8) but we were not aware of a way to get CoreCivic’s profits for corrections and detention only. The second largest private prison company is The GEO Group. Page 79 of its 2015 Annual Report stated its revenues totaled $1.84 billion. Page 79 provides that $1.4 billion of its 2015 revenue was from U.S. corrections and detention (states, BOP, U.S. Marshals, and ICE) and $341 million was from GEO Care, which includes electronic monitoring, residential youth facilities, halfway houses, etc. This sums to $1.7 billion for U.S. corrections and detention and GEO Care. Page 20 of GEO’s annual report says its “net income attributable to The GEO Group” was $139 million. Note that these profits may include profits beyond private prisons such as profits from The GEO Group’s international private prison contracts. We are not aware of a way to get The GEO Group’s profits for U.S. corrections and detention and reentry only. In sum, we estimate that the three companies received $3.9 billion in revenue from mass incarceration and immigration detention and made $0.37 billion in profits ($374 million). The figure for private corrections is one area where we are including civil and criminal costs. While these immigration detention facilities, many of which are private,22 and the confinement there are technically civil, in reality, they are quite like prisons. People in federal prison for criminal convictions of violating federal immigration laws and people detained civilly in local jails under contract with U.S. Immigration and Customs Enforcement are included in the public corrections costs. Institute for Advancing Justice Research and Innovation, The Economic Burden of Incarceration in the U.S., which finds the aggregate burden of incarceration is $1 trillion by including costs like the criminogenic nature of prison, child welfare, and homelessness of formerly incarcerated persons. Who Pays: The True Cost of Incarceration on Families, a report from The Ella Baker Center for Human Rights in collaboration with Forward Together and Research Action Design, offers a comprehensive view of the harms of incarceration on families. With particular emphasis on the disparate impact on women and the poor, the report illustrates the extreme financial burden and emotional strain caused by incarceration: families, not defendants, typically pay for court-related costs, phone calls and visitation, and continue to support people upon their release. The report also outlines the barriers formerly incarcerated people and their families face when it comes to housing, public assistance, employment and educational opportunities. No other report we know of gives such a complete picture of the far-reaching consequences of incarceration on families. The Vera Institute of Justice’s reports on the full taxpayer costs of corrections (not including policing or the judicial and legal system): Price of Jails and Price of Prisons. Price of Prisons is particularly useful for advocates and researchers who want to learn more about how correctional spending works in a particular state. Based on surveys sent to 40 states and 35 jail jurisdictions, the reports provide figures for the corrections costs that are oftentimes overlooked because they are paid by non-correctional government agencies or centralized government accounts. In addition, Prison Legal News has published a list of major for-profit privatized prison services. All Prison Policy Initiative reports are collaborative endeavors, but this report was particularly collaborative. It required multiple in-depth investigations to answer questions that had never successfully been answered before. The authors are indebted to James Kilgore, Alex Friedmann, Ruth Wilson Gilmore, John Pfaff, Chris Sturr and Bruce Reilly who all offered invaluable feedback on earlier drafts of this report. Aleks Kajstura, Lauren Powers, Wendy Sawyer, Alison Walsh, and Emily Widra helped with the research; and Stephen Raher of our Young Professionals Network provided groundbreaking research on the commissary industry, the money transfer industry, and helped us understand several other key topics. Bob Machuga came up with the initial visual design allowing us to depict how the money of mass incarceration flows. Any errors or omissions in the final report, however, are the sole responsibility of the authors. We also thank the MacArthur Foundation for their support and each of our individual donors who invests in the Prison Policy Initiative’s work and who gives us the resources and the flexibility to quickly turn our insights into new movement resources. The non-profit, non-partisan Prison Policy Initiative has been shining a fresh light on how our criminal justice system really works since 2001. Through research, innovative media work, and intersectional organizing, our staff members shape national reform campaigns from our office in Western Massachusetts. Some of his most recent work include exposing the entire mass incarceration pie, uncovering that prisons are disproportionately built in White areas, and working with Josh Begley to put each state’s overuse of incarceration into the international context. Bernadette Rabuy is the Senior Policy Analyst at the Prison Policy Initiative. Bernadette produced the first comprehensive national report on the video visitation industry, Screening Out Family Time: The for-profit video visitation industry in prisons and jails, finding that 74% of local jails that adopt video visitation eliminate traditional in-person visits. Her research has played a key role in protecting in-person family visits in jails in Portland, Oregon and the state of Texas. In her other work with the Prison Policy Initiative, Bernadette has worked to empower the criminal justice reform movement with key but missing data through the annual Mass Incarceration: The Whole Pie reports and, most recently, Detaining the Poor: How money bail perpetuates an endless cycle of poverty and jail time.